Small footprint is ideal for personal space cooling. 10" blade diameter. Two quiet speed settings. Compact design takes up little space. Lightweight for easy portability. 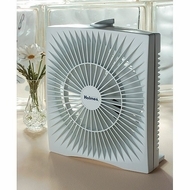 Fan Type: Floor; Width: 10".